If you have very little experience with hot tubs, you will most likely want to invest in a very straightforward, easy-to-use model, such as our Freeflow Plug N Play range. This excellent range of hot tubs doesn’t need an expert to install it or any wiring. Just fill it up, plug it in and start enjoying your new tub! If you want it for your family and friends to enjoy, you will want a larger tub that perhaps seats up to 7 people, such as the Freeflow Monterey. However, if you are only going to use it for yourself and your partner, you’ll want a smaller tub, such as the Freeflow Mini, which seats 2 and is an excellent hot tub for beginners. 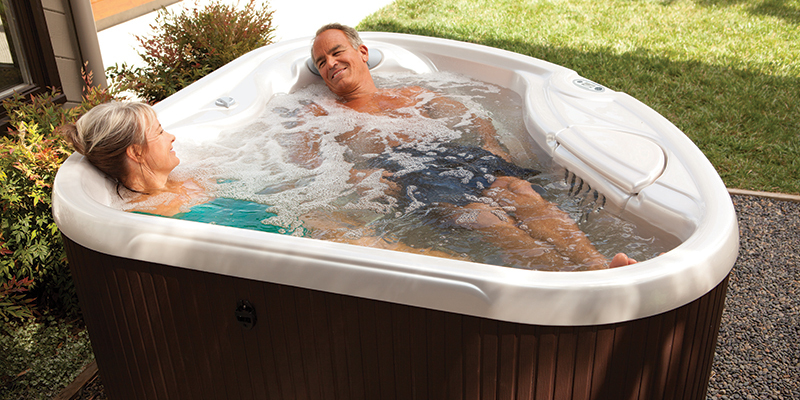 Are you buying your hot tub for health reasons such as pain relief and hydrotherapy? Or for your friends and family to enjoy music, drinks and fun water features? Consider the features your hot tub comes with. For example, the Freeflow Azure Spa uses deep ergonomic chair seating with foot-jets for two and a handrail that doubles as a waterfall, and the Freeflow Exursion features a lounger seat, ice bucket and 25 jets. Where are you going to put your new hot tub? Will you have space? How will you get an electric supply to it? If you have a smaller garden, you’ll want to think about investing in a hut tub for beginners that is compact and fits into smaller areas, such as the Freeflow Mini. For more examples of hot tubs for small spaces, take a look at our blog Small hot tubs for compact gardens. It is possible to get a hot tub for all budgets, so start thinking about yours. If you have a tighter initial budget, an inflatable hot tub might be the answer for you. However, these cost more in the long run because they are not well insulated like static hot tubs. For more information see our blog post Inflatable hot tub vs regular hot tub – which is best?